The BBA series ultrafast broadband amplifiers find universal applications in telecommunications, high-speed electronics and especially in laser and photonics research. The BBA series are primarily designed to amplify the signals of our UPD series ultrafast photodetectors. This combination is an inexpensive replacement for avalanche photodiodes. 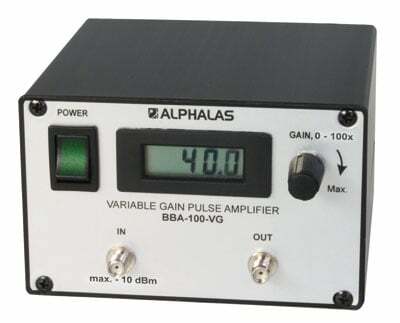 The +20 dB gain version BBA-10 (x10 amplitude amplification) features extremely low noise of only 2.8 dB. The BBA-10-4HP is the high power/high-frequency version with up to 70 mW output power and peak amplitude of max. 2.6 V on 50 Ohm load. This model is indispensable when a high output level and a wider bandwidth are required. The gain expands up to 4 GHz and +13 dB. 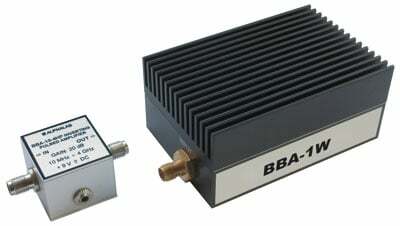 The high-power BBA-1W model has 1W output power in the range 50 MHz to 1 GHz. Even higher gain (x15 or x100) is available from the models BBA-15 and BBA-100. The variable gain model BBA-100-VG provides maximum flexibility in diverse applications. Amplitude amplification up to 100 times allows detection of low level signals. The single voltage supply and the compact design assure user-friendly operation.